Meet Lisa Godfrees, co-author of the intriguing and highly imaginative dystopian science fiction novel for young adults, Mind Writer. Born with a rare genetic mutation, Eighteen-year-old Rinee Newburgh has been kept in a secret government facility all her life. Trained to enhance her skills as a Mind Writer, her unique talents give her the ability to transfer a person’s thoughts, memories, personality—their soul—into a clone created for those deemed vital to society’s continued survival. When Rinee’s friend and right hand to the President, Andrei Malotetnev, is nearly killed in an assassination attempt, she discovers the terrible truth—that Mind Writers are regarded as disposable, and life outside the Facility is nothing more than a pollution-filled world on the brink of collapse. She also learns of Malotetnev’s plan to kill millions of people as a means of freeing up dwindling resources needed by the government. Horrified at the thought of a modern day holocaust, Rinee escapes the Facility in a desperate attempt to warn the people of his evil intentions. Locked in a race against time, Malotetnev sends his most trusted assassin with orders to eliminate Rinee at any cost before the truth can be revealed. What he didn’t count on was an assassin with a conscience. 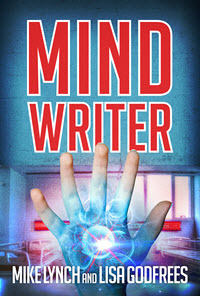 My co-author, Mike Lynch, came up with the premise for Mind Writer: A Novel. All I did was help him flesh it out. What would it be like to be able to see someone’s soul? And how would the soul of a saved person differ from someone who is unsaved? Future America – approximately 200 years in our future. Famine, pollution, and overpopulation have caused shifts in power. It’s my favorite genre to read, but mostly I write it because I have a heart for teens. I believe they need clean fiction written from a Christian worldview to counteract some our culture’s current propaganda. Truth is not relative, no matter how many people say it is. In addition to full length fiction, I enjoy reading and writing short stories. I offer one free story each week at my website. Join in the fun here. 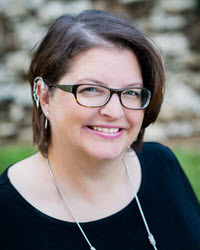 Lisa Godfrees is a writer, accidental artist, Realm Maker, short story enthusiast, Jesus girl, and science geek. But the absolute best bio ever told can be seen in this video.